Kookaburra Yoga offers short courses in yoga, meditation, yogic mindfulness, vegetarian cooking & yoga lifestyle which provide a broad and holistic introduction to yoga with specific detail on how to establish a safe, beneficial practice. These courses are gentle, systematic and suitable for people who have absolutely no knowledge of yoga or who wish to safely learn the basic practices. Informative, in-depth information is shared in classes and in a free ebook. Always wanted to try yoga? Or deepen your knowledge and experience of different aspects of yoga including meditation, mindfulness, yin yoga, and the underlying philosophy, history and science? Kookaburra Yoga offers 5 week courses covering every aspect of yoga - to suit all levels including absolute beginners. Kookaburra courses are a great place to learn and practice yoga - the peace, calm, self-understanding, vitality and wellbeing which comes with attending can potentially transform your life. A gentle, introductory yoga course designed for: absolute beginners with an emphasis on yogic exercise - safely stretching, strengthening and relaxing through a series of yogic movements, breathing and relaxation techniques. You'll learn about the 8 aspects of traditional yoga which include yoga exercise, breathing, relaxation, meditation and how to cultivate a peaceful, purposeful and healthy approach to everyday living. There is a specific focus on the movement and exercise aspects of yoga, exploring your body's natural movement pathways and capacities, then introducing ways to restore balance and wellbeing. 5 weekly 70 minute sessions. Yoga provides an understanding of both the causes of stress and the solutions to solve it! 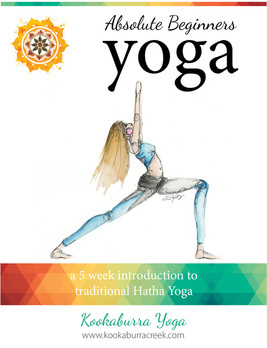 This course is an introduction to the 5 points of Hatha Yoga - exercise, breathing, relaxation, meditation and diet/lifestyle which together comprise a beautiful system of self-understanding and self-care which lead us to be calm, clear, healthy and peaceful. You'll learn level 1 yoga postures, breathing, relaxation methods and meditation techniques - and how they work, particularly in relation to stress and anxiety. Each class includes long, guided relaxation and a candlelit meditation to unwind completely! 5 weekly 90 minute sessions. 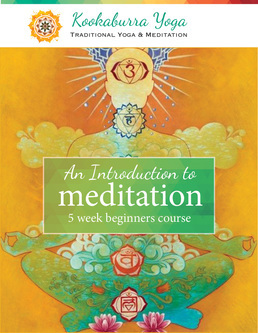 The Intro to Meditation Course complements and follows on from the Absolute Beginners Course to provide a complete introduction to the 8 aspects of traditional yoga with a focus on yogic breathing, relaxation, mindfulness and meditation. You'll learn simple, straightforward methods from the yoga tradition to help you counter stress, concentrate better, replenish energy levels, cultivate inner peace and how to develop a yoga and meditation practice at home. You'll experience the profound benefits of professionally guided relaxation which helps to reset an overstimulated nervous system leaving you rested with a quiet, more spacious mind. 5 weekly 60 minute sessions. Discover and learn the foundations of Yin Yoga in a 5 week introductory course. Yin Yoga is a beautiful, quiet and restful style of yoga which uses long, passively held floor poses in stillness. Yin Yoga is deeply nourishing and has a myriad of benefits for anyone. You'll learn the foundation yin yoga poses, how they create ease of movement, suppleness and softness of body and mind and lead to a deepening relaxation and peace of mind. 5 weekly 70 minute sessions. Yoga is a systematic method to healing, balancing and understanding every aspect of ourselves. It was succinctly articulated in the yogic text ’The Yoga Sutras (Patanjali 200BCE). Modern yoga is loosely based upon this philosophy and methodology. This system is known as ‘Raja Yoga’ and is comprised of eight components which are articulated and expanded upon in the course material and practices taught. Kookaburra Yoga's Absolute Beginners Yoga Course introduces the more physical aspects of yoga: asanas (exercise), pranayama (yogic breathing), pratyahara (deep relaxation). The Introduction to Meditation Course goes deeper incorporating the more subtle practices and concepts: yogic breathing, deep relaxation, dharana (concentration), dhyana (absorption), samadhi (merging, bliss). The practices of Raja Yoga are taught sequentially as it is very difficult (or even impossible) to practice the subtler, meditative aspects of yoga if there is stress or tension present in the mind or body. Therefore we recommend the Absolute Beginners Course as a starting point to learn to manage stress, restore balance and wellness and increase the strength and resilience of the physical body. Relaxation becomes second nature and meditation becomes a joy! The Yoga, Relax & Meditate specifically addresses stress, unhappiness, the causes, and the solutions which can be found through integrating the wisdom and methods of traditional yoga. This course complements the Absolute Beginners Yoga and Introduction to Meditation Courses, and also stands alone as an introductory course. If you're ready to delve into the vast body of knowledge which informs modern yoga practice and theory join the Wisdom Teachings of Traditional Yoga Course. You'll learn about the source texts and philosophies including the Yoga Sutras, the Vedas, the Upanishads, the Bhagavad Gita, the Hatha Yoga Pradipika and more. Yin Yoga Foundations provides a gentle introduction to this beautiful, soft style of yoga and Yoga & Mindfulness for Teens with teenage friendly and relevant content including take home resources and easy to follow yoga, mindfulness, relaxation and meditation instruction to help with stress, anxiety and pressure. Each course includes Level 1 practices which include yoga postures, breathing, meditation and relaxation methods. You'll leave feeling refreshed, nourished and deeply relaxed! If you're interested in learning about the yogic, Ayurvedic and vegetarian approach to food, nutrition and lifestyle you might like to explore the Yogi's Kitchen Courses. All courses cost $70 when paid upfront. Attending regular yoga classes can sometimes be daunting and you need to be sure you can safely participate. We have designed courses to keep you safe, put you at ease and provide a foundation of knowledge you can build on over time. Kookaburra Courses are not religious or sectarian. We provide a broad and holistic introduction to the various aspects of yoga which include exercise, breathing, relaxation, meditation and food/lifestyle. A complementary ebook with comprehensive background information. 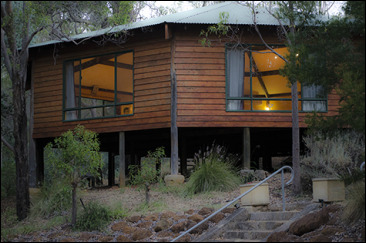 Kookaburra Courses have been developed by Kookaburra Yoga directors and senior teachers. Kookaburra Yoga director Mandy BeckerKnox's courses were developed in consultation with mentor Indra Mohan. Mandy has over 25 years teaching experience, and has studied with renowned teachers. Kookaburra Courses draw on the vast body of yoga teachings and concepts which we subtly and gently interweave within the content, providing you with opportunities to explore and understand your own inner world and experience of life - within a yogic context. Kookaburra Yoga's integrated system of Hatha and Raja Yoga includes practices which are holistic and beneficial on every level of being, bringing about internal balance leading to enhanced wellbeing and deep inner calm. You learn poses which bring inner quiet; bring focus and body awareness; bring humility and detachment; increase confidence and vitality. The deeper relaxation and meditative practices of yoga lead us to perfect stillness and calmness of body, mind and soul. Using effective and easy-to-master techniques we bring calmness to the nervous system, steadiness to the mind and control to the flow of thoughts. It is within the silence and stillness that healing and self-realisation become possible.